I used to think it was okay that the Franschhoek Literary Festival was lily-white because the money it raised was used to fund libraries in disadvantaged communities. “Who cares where the money comes from as long as it goes to a good cause,” was my reasoning. I equated the literary festival with those charity gala balls held in New York City to raise money for the poor children of that faraway country called “Africa”. Yes, the venue is exclusive and the cover charge astronomical, but that’s the whole point — to separate the wealthy from their money in the name of a good cause. 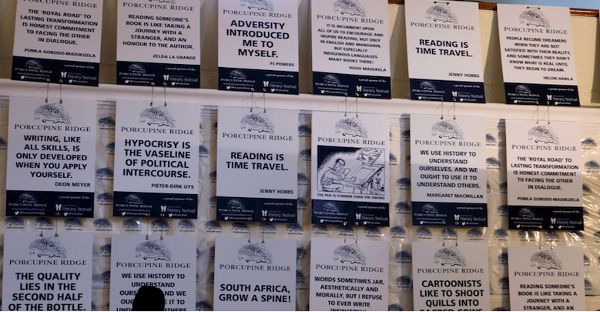 I was happy to be part of the entertainment that the punters came to see and enjoyed taking part in the Franschhoek Literary Festival (FLF) on the two occasions I was invited. But as the years passed and the audience remained stubbornly white, the FLF became the elephant in the room that many of us tiptoed around, reluctant to engage with. This year Thando Mgqolozana dropped a bombshell that blew the elephant clean out of the room and into the forefront of national debate. His words have even been quoted in the New York Times. Many black writers have weighed in on the discussion. Without exception, they have confirmed that Mgqolozana is not alone in feeling ill at ease in Franschhoek and other predominantly white literary festivals. His good friend and fellow writer, Siphiwo Mahala, bowed out of the FLF as early as 2011, and wrote about it here. The discontent has grumbled for years, so why are we only paying attention now? Perhaps it is because the literary establishment is finally coming to grips with precisely how important a writer Mgqolozana is. After years of being the go-to guy in any discussion on traditional circumcision, he is finally being recognised as a giant literary talent who stands, as Zakes Mda put it, “head and shoulders above the rest”. If he won’t be showing up to any further festivals, those festivals will be considerably the poorer for it. While writers as diverse as Eusebius McKaiser, Karabo Kgoleng, Nthikeng Mohlele, Malaika Mahlatsi, and Hawa J Golakai have all joined the conversation, contributions from white writers have been thin on the ground. There has been much retweeting and reposting of articles, along with supportive comments and vague expressions of solidarity, but not much else. I can’t speak for other white writers, but I know why I at least have kept quiet until now. If this were an issue affecting women, I would expect men to keep themselves in the background, offering support and little else. I would certainly not expect them to wrestle the mic away from the woman speakers and start mansplaining the issues to the women in the audience. I would especially not expect them to tell women that they are “overreacting” or “grandstanding”, or that the discrimination they experience is “all in their heads”. These are all accusations I have seen levelled against Mgqolozana in recent days. Similarly, I would rather chop off my typing fingers than start whitesplaining the local literary scene to black authors. This movement Mgqolozana has started does not need my approval, my sanction, my acknowledgement, or my participation. I am not a protagonist in this story. At best, I have a non-speaking, walk-on part that requires me to shut up and listen. So why am I breaking my silence? Perhaps because it seemed too easy an option to remain quiet — the lazy way out. I have nothing to add to the excellent columns written by the black writers I have listed above, but I can convey what I learned from them. From Mgqolozana, I learned — among much else — that it is not enough that money raised by the FLF goes to outreach programmes. It is not okay for black authors to be paraded before a white audience as proof of how “diverse” the festival is. It is not acceptable for a white audience member to shout out “Bullsh*t” at an invited panellist with who she happens to disagree. From Mahlatsi (who also writes as Malaika wa Azania) I learned how traumatic it can be for a young black author to face down a room full of older white people who are tutting and shaking their heads while she attempts to recount her lived experience. I have spoken in front of black audiences more times than I can count, at schools and at festivals like the Jozi Book Fair and National Book Week. Never once was I made to feel anything but comfortable and welcome. Then again, I was not facing down my social and economic oppressors. I was not being told that my opinions were wrong or that my lived experience was invalid. No one was trying to silence me, to dismiss me. Mahlatsi refers to this as a form of violence, and that is precisely what it is. From Kgoleng, I gained insight into the systemic and historical inequalities that lie at the heart of the ongoing, stubborn whiteness of most SA literary festivals. Perhaps most unnerving of all was the realisation that Mgqolozana is not seeking to “transform” or “diversify” the literary scene. He is calling for a complete revolution in ownership, funding and strategy in the publication industry. When that happens it will be the white writers and audience members who are attempting to negotiate a space for themselves at literary events. I have little doubt that they will be made to feel more welcome than their black counterparts are currently. In the meantime, I am listening and I am learning. And I know I’m not the only one. Fiona Snyckers is outrageously opinionated for a novelist-housewife. She is the author of the Trinity series of novels, and hopes to continue getting paid to make stuff up.